When you have a toddler it feels like a "lazy" Saturday or Sunday is harder to manage than a weekend full of activities. We've been trying to get out and have weekend adventures with BabyCakes on one day of the weekend and then do activities and play at home on the other. A few weekends ago we were planning to go ice skating/watch the ice skaters and hang out at the Philly Bluecross Riverrink, but because of the unseasonably warm weather in the area the ice was actually broken so the rink was closed. 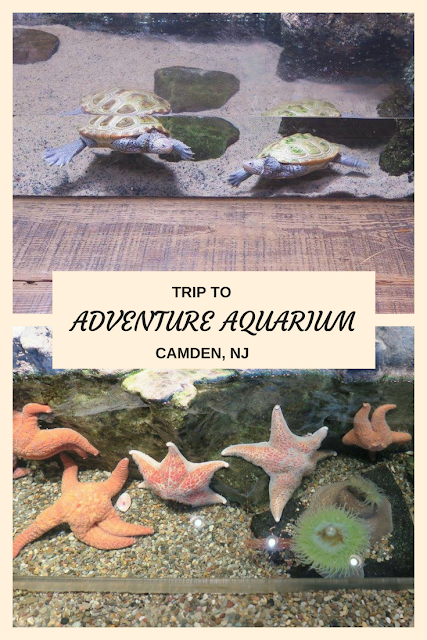 On a whim we decided we would check out Adventure Aquarium in Camden New Jersey and I'm glad we did. I think I may have been more amazed by the aquarium than BabyCakes. My favorite was the Nemo and Dory tank. It had a tank full of clown fish and one blue tang. It was so cool to see the movies represented in real life. I was also blown away by a GIANT turtle they have in the Ocean Realm exhibit. Love aquariums and turle. Looks a nice place to go to. My kids have always loved the aquarioum. It is a great place!